Do you know I've completely stopped buying flavored waters for Pierce's lunch this year? It's one way I've been saving a little money and reducing waste. Luckily, our water at home comes from an underground stream that feeds our well, and it's really delicious. And sometimes I give Pierce an extra treat by flavoring the water for him. 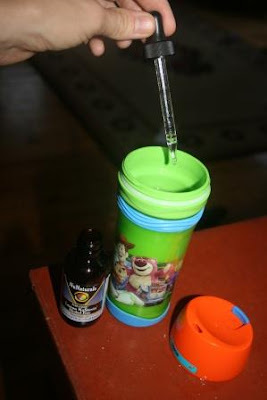 I love the NuNaturals Stevia flavorings - it only takes a few drops and doesn't have any sugar. Pierce loves the lemon and orange flavors. I like the vanilla best. The twins are just excited any time I flavor their water regardless! NuNaturals sent me some new products to try recently. Reid and I made brownies using their Presweet Tagalose (which is safe for diabetics) to replace the sugar. It even contains prebiotics to feed healthy bacteria in the stomach. Course the m+m's we used on top do have sugar, but overall I felt better about the amounts the boys were getting in these brownies, and they tasted great. 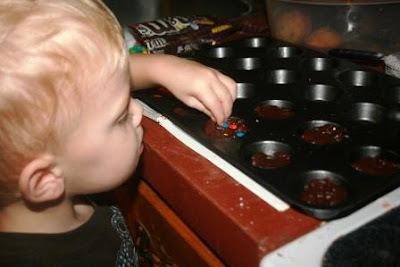 Reid was really proud of his decorative artwork, and his brothers were impressed as well that he helped in the creation of these mini brownies. Disclaimer: I've really enjoyed trying the NuNaturals products to find ways to reduce the amount of sugar we're eating. They recently sent me some new products to try, but I wasn't under any obligation to blog about them. These sounds great! JDaniel loves flavored water. Glad you guys have good water, after drinking spring water for years right out of the ground, city water smells like swimming pool water to me. I should probably start flavoring my water--it might help me drink more! The brownies look delicious. 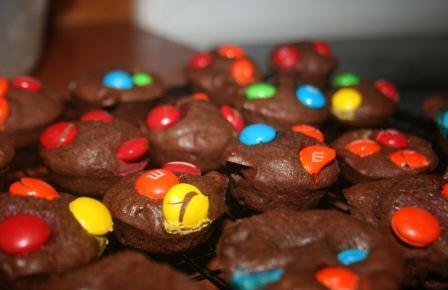 Oh, those mini brownies sound delicious! I'm a sucker for anything with MM's and chocolate! Those brownies look great. I haven't tried the tagatose yet but need to at some point. My Hubs loves it in his coffee and bought 5 more pounds of it. those brownie bites look delish! The vanilla flavor sounds intriguing. May have to give that a try! I've been using raw sugar for my coffee and eliminating all refined sugar from my diet where possible. I'd like a brownie, pretty please...:) Good job, Reid! That cake is so fun on my post, huh? I found it on Google Images. I have a ton of thing in Pinterest but I can recall my password.... grrrr. Anyway. You could so make that cake for your guys and they would LOVE IT! You come up with the best ideas for saving money. I could have used this when TJ's kids were young for sure. I love the look of those brownies!! They look delicious! I am all for ANY way to reduce sugar. Thanks for the info. I've never heard of NuNaturals. Do you buy yours online? I am going to send the self addressed envelope for a few samples. My dh uses stevia. I've been wondering about the flavored ones. I'll have to try them. He does have diabetes. Sounds like a cool product! My husband likes flavored water so I'll have to give it a try. I do like the flavored stevia and the Presweet Tagalose is awesome to make treats for my grand kids. I hope you have a great weekend. The brownies look so yummy! I've been looking for an alternative to diet soda or plain water so I'll have to give these a try. So did they love the brownies? the brownies look so yummy! I usually send brownies to work with hubby weekly. :) I like hearing about the products from you, thanks! That's a great idea, flavoring the water! That is good... to reduce sugar!!! Oh...and Reid did well, yes he did..
Well done, the decoration is superb! I would love to have a brownie right now.. THe new sweetener looks like something I could use. Diabetes is no fun and I try and find something I can use is cookies.. Drinks at our house is mostly water and milk. mica likes almond milk and Isaak likes cows milk. A good idea flavoring the water. The vanilla does sound good. I never even thought of flavouring the water. It never was a problem for Deaglan, he loves water but that little Naveen, he asks for juice non-stop.